Quality Black Acrylic Desk Blocks show that you have set a level of excellence for your company that goes above and beyond. These thick and modern desk blocks command attention and stand by themselves. These fancy name plates look great on a desk or anywhere else you would like to display them. COLOR: The block is a clear acrylic with a black, opaque coating on the back. Available with front engraving fill in white, gold or silver. 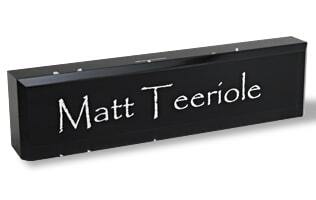 PRICE INCLUDES: One Black Acrylic Desk Block with one or two lines of engraving. Shipping costs will be displayed in the shopping cart.